On nice paper you could copy one these poems or the poem you wrote in your best printing and decorate the edges of the paper with drawings of the activities and items you mention in your poem. Science – Answer the following questions: Why must syrup be bottled hot? What temperature should it be bottled at? Compare the bottling process to canning vegetables from the garden in the summer - what would happen if you put the vegetables or fruits in the jars and did not heat them to seal the jars but left them as they are? Graphics for the following math question are at the end of the page. 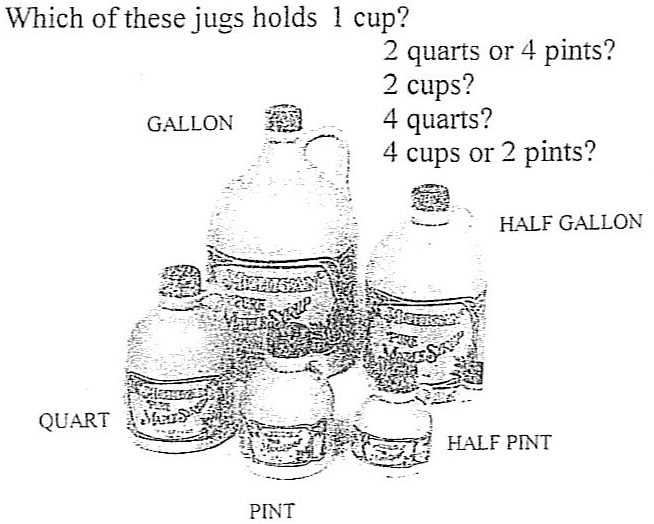 Math – 1 Which of these jugs holds 1 cup? 2 quarts or 4 pints? 4 cups or 2 pints? 2If Mr. Goering bottled 450 jugs of syrup to sell at the festival and 386 were sold, how many jugs were left? How much syrup in needed to bottle this order? 2 We normally bottle 8 ounce, pint, quart, half gallon and gallon jugs at our bottling station in the sugarhouse. We bottle the syrup in batches of 45 gallons at a time. Approximately how many of the above containers would be used if the same number of each size container were bottled using the 45 gallons of syrup? Hint – one gallon of syrup contains 128 ounces – this question uses algebra!!! Art Design a new maple syrup container that you would enjoy buying syrup in. You can look on our site at www.lmsugarbush.com to see what kinds of containers we sell our syrup in. You can design a plastic jug, glass bottle or tin container or all three. Have fun and let your imagination run wild!! Language Arts - Make as many words as you can from the words maple syrup – answers are on this link – I have never heard of some of these words!!! Science - Make maple candy from Leane and Michael's Sugarbush pure maple syrup - available on this site on the MAPLE SYRUP page. Math – Make a graph of historical production using the information in the link above. Use any type graph of your choice. 1 If a customer bought 3 half gallons, 2 quarts and 4 pints, how many jugs of syrup did they buy? If there are 8 jugs of syrup available to buy and a customer bought 5 of them, how many are left? 2 If the Goerings are putting maple candy in bags to sell and each bag gets 5 pieces, how many bags can they fill with 45 pieces of candy? If it takes 1 gallon of syrup to make 8 pounds of candy, how many gallons will it take to make 24 pounds of candy? If a customer buys a quart of syrup for $11 and the customer pays Mrs. Goering with a ten dollar bill and a five dollar bill, how much change will he get back? If it takes a gallon of maple syrup to make 8 pounds of maple candy, how many gallons of syrup will it take to make 72 pounds of maple candy? If the Goering children bag 1055 pieces of maple candy in 5 piece bags to sell at the festival how many bags of maple candy will there be? If there are 48 pieces of maple candy in a pound, how many pounds of maple candy did they bag? Art –Using this recipe make and ice gingerbread men. Enjoy!!! Leane and Michael's Sugarbush pure maple syrup available on this site on the MAPLE SYRUP page. Math – 1-4 Use a map and calculate how far it is from your house to the Sugarbush in Salem, estimate how long it will take to drive from your house to ours. 2 The Goering family uses about 12 gallons of syrup each year, but they use it in quart containers. How many quarts of syrup do they use? How many half gallons would they use if they used it in half gallons instead? 3-4 If on Saturday of the festival 60 pounds of flour were used to make pancakes and Sunday’s pancake sales are usually about 80% of Saturday’s, how many pounds of flour will be used on Sunday? If 95 pounds of flour were purchased for the entire weekend, how many more pounds do the Goerings need to buy to have enough for Sunday? It would be wonderful to bring a camera to the festival and add photographs of your experiences at the festival to your notebook. Music – This site has a fun song for review of the maple syrup making process. Add some verses of your own using what you have learned in this unit study. Note: If you come to our festival and see our historical demonstrations of early syrup making and take the tour of our syrup making operation you may hear some statistics and facts that differ from what you have read on these sites. Every sugarmaker does things just a little different and some sources of information may give different perspectives on the history of syrup making so the statistics and historical facts presented may vary a little. Make a notebook using a 3-ring binder and include all your writing projects, lab reports, drawings, etc. in protective plastic sleeves, make a nice cover for your book and save it with your other school projects. Hope you have enjoyed learning about maple syrup!! COLLECTION - In the late winter when the nights freeze and the days warm up the sap will run. Drill a 7/16" hole in the maple tree, 2 1/2" deep. Slant the hole slightly downward. The collection systems we have displayed here are the ones we have used ourselves. BOILING - Kettles such as those at the Pioneer demonstration can be used. These will make about one gallon of syrup per day. With a good fire a rule of thumb is that two square feet of boiling surface area will evaporate one gallon of sap per hour. One new way for the small producer to boil sap is to use this propane powered unit, new cost of $75 (not including propane cylinder). Syrup is finished at 219 degrees F. A regular candy thermometer is accurate enough for the small producer. A few large, front yard maple trees can produce enough syrup for a family, although it is a lot of work. However, we believe the effort is worth it. Try it as a school science project or just for the enjoyment of making such an historical North American food. This is an interesting project for a school group to do together. The children on this site drew pictures of what they had learned about syrup making and put them together to form a quilt. This could be done on paper or on fabric.